Poster dunks are great, but inevitably that guy comes along and says, "we should cheer the guy that was willing to contest the dunk, not laugh at him." That guy is mostly just a smarmy highlight truther, but he does spout a kernel of truth. 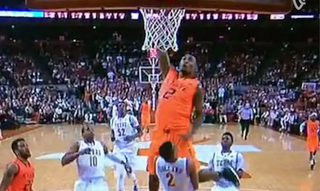 Well, there is no need to hold back from enjoying this dunk by Oklahoma State's Le'Bryan Nash against Texas tonight. This defender knew that he was beat, but hoped and prayed that he could draw a bogus charge call. He did not, and instead was rewarded with a faceful of basketball shorts.